Started by metmike - April 8, 2019, 12:15 p.m. Here's the weather that affects the natural gas market. Cold causes an increase in residential heating. Hot causes an increase in residential cooling. Are you sure you want to delete this post: Natural Gas week of April 8, 2019? 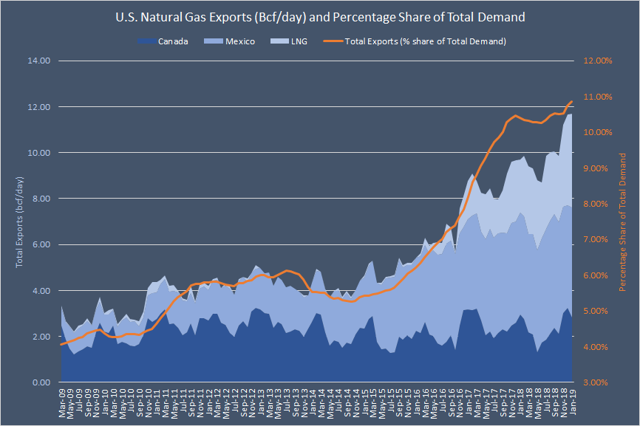 By metmike - April 8, 2019, 12:17 p.m.
Are you sure you want to delete this post: Re: Natural Gas week of April 8, 2019? By metmike - April 8, 2019, 12:21 p.m.
"Natural Gas Futures Near Even Early; Weekend Guidance Trends Warmer"
metmike: Natural Gas modestly to strongly higher this morning despite warmer guidance. Probably just seasonals, low price and low storage as well as good support at last weeks lows and technical bouncing around. Weather is just now powerful enough right now to make much difference in demand/usage. Are you sure you want to delete this post: Re: Re: Natural Gas week of April 8, 2019? By metmike - April 8, 2019, 12:23 p.m.
Look how fast the mild weather in December and early January caused us to close the storage gap below. But the gap widened some vs the 5 year average and last year again because of extreme cold several weeks ago. We turned very chilly late last March into April(2018) with some unusually late season drawdowns............so the current deficit from last year has started to erode. 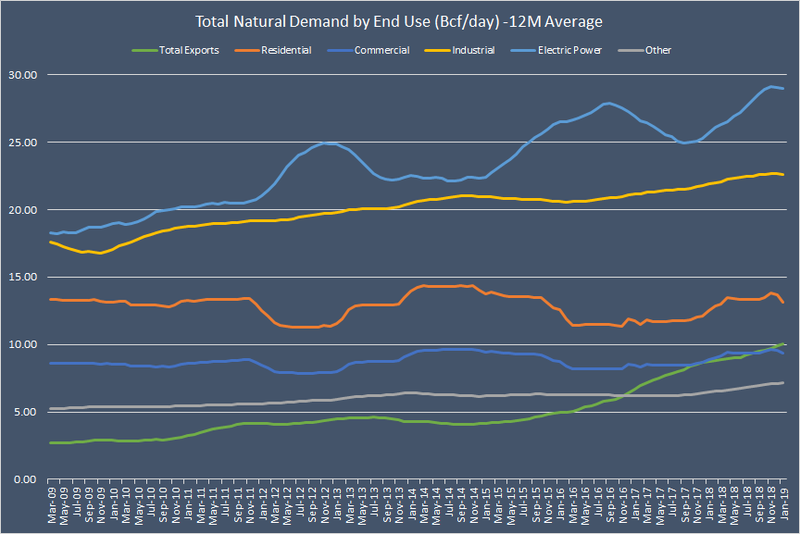 Are you sure you want to delete this post: Re: Re: Re: Natural Gas week of April 8, 2019? By metmike - April 8, 2019, 12:25 p.m.
Last Thursday's EIA report was a bearish surprise! The Energy Information Administration reported a 23 Bcf injection into storage inventories for the week ending March 29, massively larger. Are you sure you want to delete this post: Re: Re: Re: Re: Natural Gas week of April 8, 2019? By metmike - April 8, 2019, 12:26 p.m. These were the 7 day temps, ending the last Friday in March that went into last Thursday's EIA number released at 9:30am Central. By metmike - April 8, 2019, 12:28 p.m. These were the (colder) temperatures for the 7 day period ending last Friday............which will go into this Thursday's EIA report. By metmike - April 8, 2019, 12:29 p.m. The point of showing it is to show that natural gas has a strong historical tendency to go up from mid February into April. Last Thursday's EIA report was a bearish surprise. By metmike - April 8, 2019, 12:30 p.m. 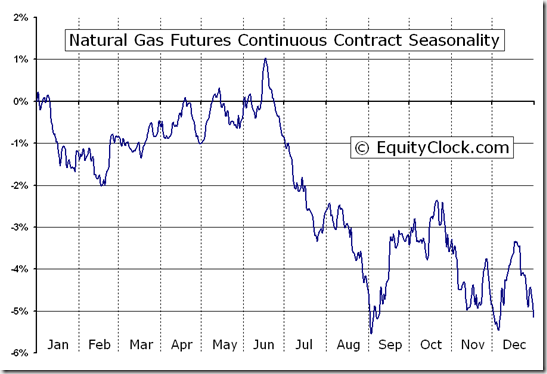 These natural gas price charts aren't the greatest but they do show a likely seasonal bottom. The Feb price dropped down and tested the Jan lows for the May contract which is now the front month and reversed higher. 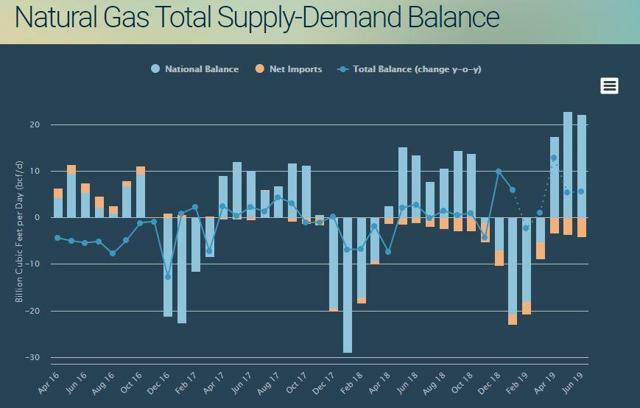 By WxFollower - April 8, 2019, 1:02 p.m.
weather in highly-populated regions may spark an uptick in gas demand." It appears Mike agrees with me that this is not the reason NG prices are higher being that forecasts and models were a good bit warmer vs the Friday runs for the key two week period. So, they're clearly reaching as wx isn't always the primary market moving factor. By metmike - April 8, 2019, 1:09 p.m.
Maybe they are looking at the cold snap late this week? This seems like a stretch since it's not sustained and as you said the overall forecast late Friday, especially on the EURO ensembles had more HDD's. This last 12z operational GFS that just came out is a bit colder but we'll see what the ensembles show. The 2nd week of April is just not a good time to be hanging your hat/position on individual model solutions though we both agreed, the colder Euro ensembles on Friday afternoon gas ng a late pop. By metmike - April 8, 2019, 1:27 p.m.
Natural gas storage reports compared to expections...........last 5 reports, with the estimate for this next one being +10 bcf vs last weeks +23 bcf. By WxFollower - April 8, 2019, 1:59 p.m.
Mike said; "Maybe they are looking at the cold snap late this week? This seems like a stretch since it's not sustained and as you said the overall forecast late Friday, especially on the EURO ensembles had more HDD's." "'Cooler conditions will spread across the northern and central U.S.
reach the east next weekend.'" 1. The 0Z Monday EPS is a whopping 23 HDD warmer than that colder 12Z Fri EPS that moved the market over a penny late. This is mainly due to big HDD losses for 4/11-19, which encompass that cold snap. That colder 12Z Fri EPS had been a whopping 17 HDD colder than the 0Z Fri EPS. Therefore, the 0Z Mon EPS is actually 6 HDD warmer than the 0Z Fri EPS! 2. The 0Z Monday GEFS is 13 HDD warmer than the 12Z Fri GEFS, mainly due to a significantly warmer 4/12-17. 3. The morning forecast for Radiant was ~9 HDD warmer than their Fri morning forecast. Conclusion: I don't see how changes in wx forecasts/models could have possibly lead to higher NG prices this morning. It had to be due to other factors. By metmike - April 8, 2019, 2:08 p.m.
As noted above, this year, we already had our first injection of natural gas +23 bcf.....compared to last year(2018) when there was a withdrawal -34 bcf for the same week. For the next 4 weeks, this is what I have for the 2018 EIA reports. Last weeks +23 bcf was compared to last years -34 bcf. As a result, we should be closing some of the storage deficit gap with 2018 over the next 3 weeks, at a time when, last year, there was a total drawdown of -74 bcf, which has got to be a record for so late in the season. On the 5 year average for the next 4 weeks, this is what I have. Last weeks +23 bcf was compared to the 5 year average of -23 bcf. 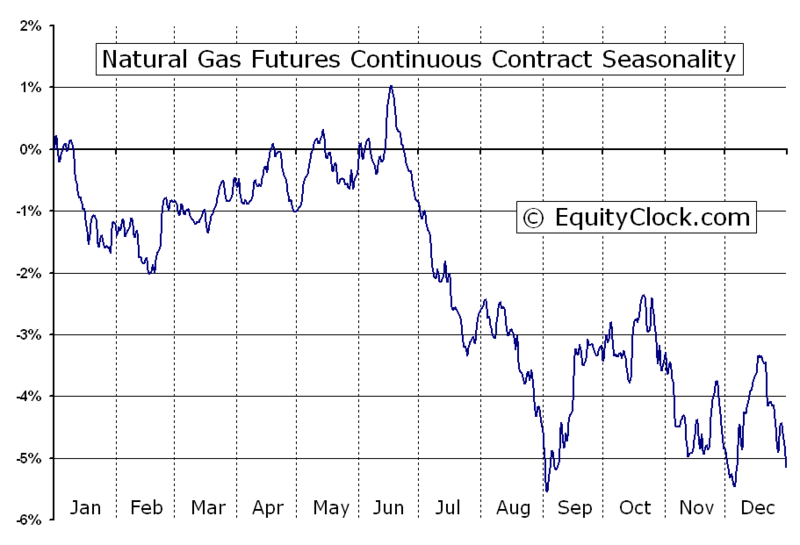 By metmike - April 8, 2019, 7:04 p.m.
Natural gas futures continued to gain ground Monday despite warmer changes to weather outlooks. Strong cash prices at the end of last week that further strengthened at key pricing locations for the start of this week lent support to the futures strip, with the Nymex May contract settling 4.4 cents higher at $2.708/MMBtu and June rising 4.2 cents to $2.748. Are you sure you want to delete this post: Re: Re: Re: Re: Re: Natural Gas week of April 8, 2019? By metmike - April 9, 2019, 11:56 a.m.
Are you sure you want to delete this post: Re: Re: Re: Re: Re: Re: Natural Gas week of April 8, 2019? By metmike - April 10, 2019, 11:23 a.m.
Are you sure you want to delete this post: Re: Re: Re: Re: Re: Re: Re: Natural Gas week of April 8, 2019? By metmike - April 11, 2019, 10:38 a.m.
Are you sure you want to delete this post: Re: Re: Re: Re: Re: Re: Re: Re: Natural Gas week of April 8, 2019? By metmike - April 12, 2019, 12:17 p.m.
By metmike - April 13, 2019, 5:59 p.m.
By metmike - April 13, 2019, 6:07 p.m.